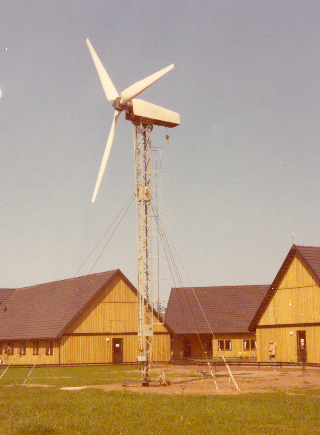 In 1975 - At the NOAH "Miljø-Ø-Lejr" summer camp at Rugård beach by Grenå , a 300 Watt Wind Turbine was build, partly by draft resistors from the Kompedal Camp. The turbine, which had wood blades, would power a refrigerator at the summer camp. We, at NOAH Viborg delivered a 121 mirror solar furnace as well as a solar water heater. The nacelle of the wind turbine was later moved to Viborg, where we equipped it with steel blades ! 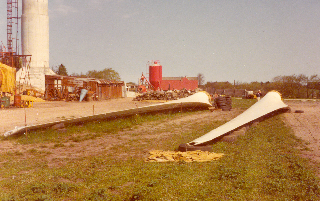 For the 1976 NOAH summer camp, Erik Grove-Nielsen made his first fibre glass blades for the wind turbine. On a windy day in the camp, one of the blades hit the tower, and the turbine was stopped. The blades and nacelle is still stored by Erik. In 1973 we experienced a global oil-crisis, as the OPEC countries reduced their production, and scared the world. The Danish government and the major Danish power companies wanted to establish nuclear power plants in Denmark as fast as possible. This aroused a major public discussion in the media. In this environment the Danish wind power business was born in the years 1974 - 75. At the central square in Viborg we (NOAH) had a display of solar collectors, wind turbine models (The Gedser turbine) and information on nuclear power. The anti nuclear organization OOA was formed in 1974, as a reaction against the plans of ELSAM, RISØ and the Danish government to build nuclear reactors in Denmark. In 1975 OOA had a nationwide meeting at Bryrup. At this meeting it was decided to break up the organization in two parts to enable some of us to work more on the new alternatives. This was the birth of a new organization OVE (The Organization for Renewable Energy). The rest of OOA would still concentrate on gathering information on the treats of nuclear power. The sun says "Look up you fools!" A solar water heater, an ugly scale model of the TVIND turbine, and a solar cooker made of 121 focused mirrors was part of the display. Part of the display at Viborg museum "Pakhuset"
The NOAH 300 W turbine with steel blades, erected in central Viborg behind the museum "Pakhuset" winther 1975.. The 250 kW Gedser turbine was established by power company SEAS back in 1957 as the result of the work of wind turbine pioneer Johannes Juul. The Gedser turbine was finally stopped in 1967. Years later the turbine was run again for a period, for measurement purposes, partly paid for by US NASA / DOE. May 29th 1975 the construction of a very important wind turbine began in western Denmark. The TVIND-schools were established from 1970 and onward, inspired by charismatic Amdi Petersen. They wanted to produce their own electricity and heat, partly because of the high cost of oil after the1973 oil crisis, but also because they did not want nuclear power to be part of the Danish power system. They were convinced that the people could come up with a better solution. If a lot of people worked together, they would succeed.... Consequently they started constructing a 1 MW wind turbine in windy western Jutland! A lot of people volunteered on building the turbine. The building of this big machine gave confidence to people: We do not have to wait for governments or big companies, we can do it together. In the following years many self builders visited TVIND, picked up inspiration and build their own smaller turbines. March 26th 1978 the TVIND turbine began producing power. Tvind turbine - base - in 1975 - built by students..
Before Tvind made the three 27 m long blades, they started learning how to work with fibreglass by building three fishing boats. After building the fishing boats, they designed and built a set of 4.5 m blades for a 11 kW turbine PTG. (Praktisk Teoretisk Grundkursus). The blades were designed for 115 rpm, but then downgeared to 75 rpm, which explains the somewhat low power output for this approximate 10 meter diameter Turbine. The PTG turbine was a down wind machine, with passive yaw. The gearbox was constructed from the rear-axle assembly of a truck. Part of it was used for the yaw bearing.